Home / FT Lite/ The Ceylon Crab: Finger-licking goodness! The Ceylon Crab: Finger-licking goodness! Crabs may be scrumptious but they are notorious for their high cost; fortunately home-based seafood caterer The Ceylon Crab offers a variety of crab dishes at prices that are affordable and tastes that are exceptional. 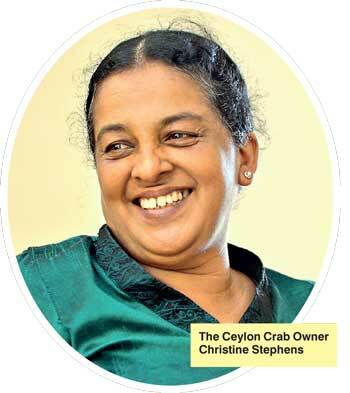 The Weekend FT met The Ceylon Crab Owner Christine Stephens who has been running the business for the past four years and had the delightful experience of sampling her magnificent range of seafood. “My aim is to give everyone a good product and not charge too much because everyone likes to eat something nice and it shouldn’t be out of reach. Crabs are really overpriced and are only for the rich. There are so many people in Sri Lanka who have never eaten crabs because it’s so expensive,” she said. Her career with crabs didn’t start off with catering – Christine used to export them to Singapore and Hong Kong for a few years. During those years as an exporter, she put surplus into good use by trying out crab recipes and distributing her dishes to friends. She turned out to be quite an awesome self-taught cook and when she left the export business it was suggested that she cook seafood on a commercial scale and thereafter she launched her catering business full-time, also making prawns, lobsters and baked fish but with her main focus on crabs. Business was good – she knew where to source crabs of good quality as the suppliers and fishing areas were familiar to her. When we went to see her, she had a lovely layout of crab dishes on her table and these were accompanied by side dishes – roast paan and pol sambol – to give us an idea of how her crabs can be savoured. Though the sambol is not what this review or her business is about I shall let it steal the limelight from the crabs for a second so I can mention how much I enjoyed it! I am quite fussy about pol sambol having the right blend of ingredients – failure in the mix results in an utter flop; this one was perfect! These gorgeous little ones were the most tempting and I therefore grabbed them first. Christine suggested they be eaten with garlic bread or salad but I didn’t need any of that! These were superb eaten as the main meal. They looked so creamy and juicy and the taste did not disappoint. I found fresh, tender crab meat mixed with cheese, cream and herbs and used as stuffing in the crab shells, with a generous topping of cheese and a dash of parsley. Baked to perfection, this dish was soft, fresh, creamy and absolutely delicious. It was also very filling, leaving me satisfied till dinner time. It would definitely be a big hit with kids too. This can be eaten with rice, garlic bread, salad or even noodles. I had it with rice. It has a Western touch with its mild flavour coming from butter, cream and egg but she throws in some curry leaves for a bit of an Asian touch as well. The crabmeat was soft and the gravy had a lovely creamy taste – another crab dish kids would love as much as grownups. People who are not fans of spicy food need not be turned away by the name. Though it is called ‘Chilli’ Crab, I found it to be more on the sweet side with just a slight tease of spice. This is owing to its blend of chilli, ginger, garlic, tomato ketchup and various sauces. She also adds a beaten egg and a shrimp paste into that. The sauce was so delightful I scooped the gravy now and then to taste just the sauce alone. This dish is apparently a popular one in Singapore. Butter, oyster sauce, soya sauce, shrimp paste, pepper, ginger, garlic and onion go into this while a bit of cornflour is used for thickening. Just as the name implies you get the strong taste of black pepper and Christine says it is toned down slightly with butter but I still wouldn’t suggest it for those who don’t like spicy food – I had sips of water in between bites as it was too spicy for my palate but I reckon it would be quite the treat for those who crave for spice. Also known as Jaffna Crab Curry, this one is a typical Sri Lankan crab curry and sticking to tradition, is cooked in a claypot. Jaffna curry powder, tamarind, salt and coconut milk contribute to the delicious taste and during the finishing touches a few sprigs of drumstick (murunga) leaves, which are famous in Sri Lankan curries for their ability to assist with digestion, are tossed in and given a quick stir just before taking the pot off the fire. Indulging in a lovely Sri Lankan crab curry moment, I dived in and got my fingers covered in curry and got the table a bit messy too with the splashing but didn’t really care because I was enjoying the soft delicious meat and its yummy curry. The thick gravy and flavourful crab made for a delightful experience and is best eaten with pol sambol and bread or with rice. This is also made to the traditional Sri Lankan recipe and in a clay pot offering a beautiful intense flavour. Finger-licking goodness is what I experienced here. The flesh was soft and tasty and I devoured it with her bread and pol sambol! I took my time with this – it is one of those meals that should be savoured slowly. Christine caters to events, parties, family and office gatherings as well as individual orders. Individual orders can be placed a day ahead while large orders need to be placed two to three days in advance. Exploring varieties, she started making pies and lasagne last year – which was a big Christmas hit. This year she has plans to introduce a few more new dishes to the scene and will be adding them soon. These include ‘Tandoori Crab’, ‘Crab Masala’, ‘Crab Rice’, ‘Thai Crab Curry’, ‘Crab Claws in Ginger Sauce’ and ‘Garlic Butter Crab on a Bed of Ginger’.Judging from the lip-smacking variety she served me, there is no doubt that her upcoming dishes would be big hits too!